In this post, we will see difference between checked and unchecked exception in java. It is important question regarding exceptional handling. Exception is unwanted situation or condition while execution of the program. If you do not handle exception correctly, it may cause program to terminate abnormally. 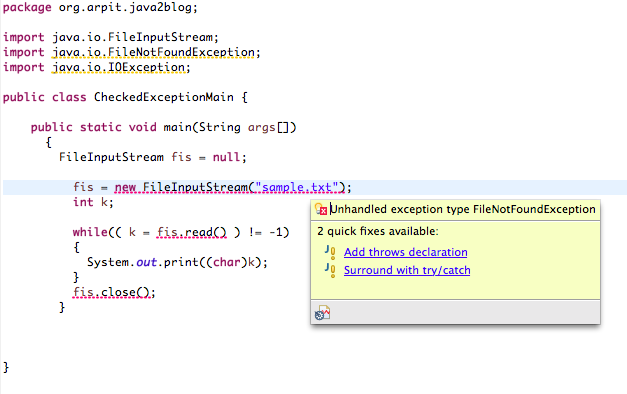 Checked exceptions are those exceptions which are checked at compile. If you do not handle them , you will get compilation error. so there are two options two solve above compilation error. you can put error code prone in try block and catch the exception in catch block. As you see, we have put error prone code in try block and various exceptions in catch block. Using throws : You can use throws keyword to handle exceptions. As you can see , we have used throws keyword to handle the exception. Unchecked exceptions are those exceptions which are not checked at compile time. Java won’t complain if you do not handle the exception. You can go through core java interview questions for beginners and experienced for more such questions.